Before the envelope is opened, let us know your thoughts. Paige MacGregor, who makes her debut at Cinema Sentries, joins me in reflecting upon this year's Academy Award nominations, which are handed out Sunday February 26th on ABC. 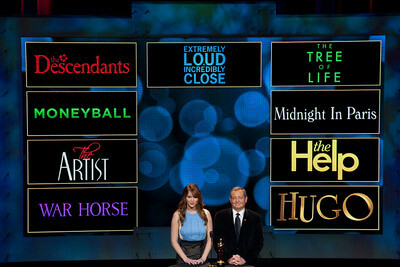 PM: Where is Ides of March for Best Picture, and why - why - are The Help and The Descendants on this list? The Help looks like the most painful movie released in 2011, and while The Descendants was entertaining, it was very poorly acted and not very well written, either. Not to mention... nine movies? GM: After paying attention over the past year to some of the self-appointed movie observers from the chattering classes, there didn't seem too much surprise in the Best Picture nominees except the poorly received Extremely Loud & Incredibly Close but then a good number of Academy voters can be a soft touch. I didn't have the problem you did with The Descendants, but I agree The Help looks a bit obvious as it reminds us that racism is bad. PM: As far as Best Actor in Leading Role, I'm again confused why George Clooney is nominated for The Descendants. That movie just isn't Oscar-worthy, nor is his performance in it. Gary Oldman in Tinker Tailor Soldier Spy, however, is phenomenal, as always. In fact, I'd like to see several of the actors from that film take home an Oscar this year. PM: With regard to Best Actress in Leading Role has Albert Nobbs even been released yet? I haven't seen any of the movies that these women are nominated for, but I'm guessing that Glenn Close or Meryl Streep should win this one. GM: Albert Nobbs played enough to be eligible, and although everyone is talking about Meryl Streep's performance, as they always do and deservedly so, when I saw it at the Toronto International Film Festival, I thought Glenn's performance was outstanding. PM: I thought it was sad that Tomas Alfredson wasn't nominated for Tinker Tailor Soldier Spy. The film is really very well done - subtle, complicated, and intriguing - and unfortunately I think that may be the very reason why it's overlooked. GM: While the directing selections are fine by me, I am surprised Spielberg didn't get included because War Horse seems like such a bigger undertaking for a director than The Descendants or Midnight in Paris. Just don't call it a snub. Makes it sound like he was entitled. I'm rooting for Woody, but think Scorsese's ode to movies will trump Michel Hazanavicius' ode, even though he seems to be the favorite with all the awards The Artist has already won. PM: In the Writing (Adapted Screenplay) category, I'm torn between The Ides of March, which is phenomenal, and Tinker Tailor Soldier Spy, but I'm leaning towards the former because I think it's a very underrated movie this year. GM: I am surprised The Artist is in the Original Screenplay category considering all the movies it appears adapted from just from its trailer. PM: Granted I haven't watched Transformers: Dark of the Moon (my own special form of protest for replacing Megan Fox - and yes, I know she's a terrible actress, but I do love her... I hope that doesn't affect my credibility), but I think I'll puke if Michael Bay wins an award for Visual Effects for that movie. It's Transformers, for Christ's sake. GM: Billy Crystal returning as host has me a little nauseous. Below is the complete list of nominees with links to reviews covered by Cinema Sentries. Who do you think should go home with Oscar? Who deserved a chance? Who doesn't? Let us know your thoughts in the comments.